BSAS, Boston, Phnom Penh, and Beyoooond! Officials from Cambodia are to travel to Iran next week and the two countries will sign agreements covering cooperation in the oil sector, the foreign minister of the Southeast Asian state said on Friday. AN 18-year-old ethnic Tampuon woman from Ratanakkiri province returned home last week after neighbours allegedly took her to the capital for job training without her family’s permission. However, the woman, Leith Dauth, said yesterday that she had volunteered to go to Phnom Penh, and only decided to return to Ratanakkiri after learning that her parents disapproved of her plan to go work in Malaysia. 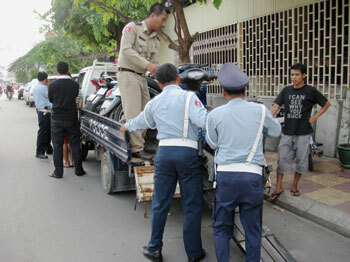 TRAFFIC police in the capital have resumed seizing the motorbikes of helmetless drivers and those who lack side mirrors, despite the fact that the Land Traffic Law does not list vehicle confiscation as a possible punishment for such offences. 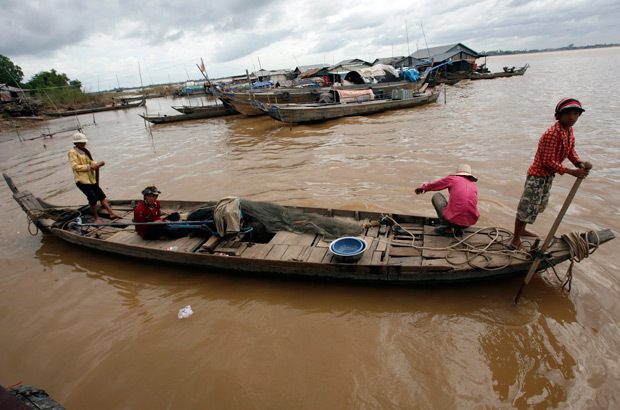 Cambodian government said Thursday that 88 people, mostly in rural areas — have died of lightning strikes. Keo Vy, communication officer of National Committee of Disaster Management said that by the end of July, there were 88 people have died in lightning strikes. However, he said, the figure is still less than that in the same period last year as 110 died of lightning incidents. AGRICULTURE Minister Chan Sarun has accused courts of dragging their feet on forestry, agriculture and fisheries crimes, claiming 70 percent nationwide have not been to trial. In remarks delivered to Forestry Administration workers in Phnom Penh, a copy of which was obtained yesterday, Chan Sarun attributed the backlog to “a lack of cooperation”. A JAILED journalist whose Appeal Court hearing is scheduled for later this month said yesterday that he had been asked to pay US$1,000 before court officials would tell him the exact date. The charming riverside capital of Phnom Penh, home to about 1.5 million inhabitants, has seen a lot in its turbulent history. But arguably nothing is on the scale of its first skyscraper, the 42-floor Gold Tower now nearing completion, not to mention the university and bank complexes mushrooming throughout this ancient city. The survival of some of the world’s largest freshwater fish, including a giant catfish, is threatened by a series of hydroelectric dams planned for the Mekong River, a leading environmental group has warned. The construction of a particular dam in northern Laos would disrupt the migration of four of the world’s 10 largest freshwater species to crucial spawning grounds, the World Wide Fund for Nature (WWF) said. Ask Cambodian Workers: What Good Has ‘Corporate Social Responsibility’ Done? Tens of thousands of workers in Cambodia and Bangladesh have protested numerous times over the last ten weeks, due to expected national minimum wage adjustments (which are behind schedule); their wages are never raised through the dignified means of collective bargaining. Look back to 1998 when a prominent FLA member (Patagonia’s Kevin Sweeney) wrote in the Los Angeles Times: “We Can Work Up To a Living Wage.” So, what’s happened over the past dozen years? “Enemies of the People” is another disquieting testament to the fact that ordinary individuals under extreme pressure will carry out the most monstrous crimes. If they hadn’t followed the orders of superiors, they say, they themselves would have been killed. One farmer, a Buddhist who believes in reincarnation, expresses his tormented certainty that it will be many lifetimes before he returns in human form. Aki Ra, leader of the nonprofit Cambodian Self Help Demining team, works to make his country more safe by clearing land mines on a daily basis. He estimates that he and his team have cleared more than 50,000 land mines — some of which he planted himself. The sentencing of Khmer Rouge torturer Kaing Guek Eav this week and the forthcoming trial of former leader Khieu Samphan by a United Nations-backed court has brought renewed attention to their murderous rule of Cambodia in the 1970s — and a certain amount of satisfaction in the “international community” for its role in seeing justice done.